Each year, the AAA Foundation for Traffic Safety conducts a study examining driver opinions on what constitutes safe habits behind the wheel, while also polling them on their own driving habits. 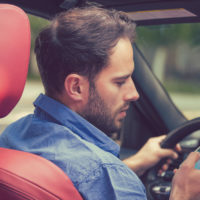 The results of their latest survey were released earlier this year and reveal a disconnect between what drivers know to be safe, and what they do when they’re driving. The AAA Foundation conducted its research by surveying over 2,000 drivers aged 16 and up who had been on the road in the previous 30 days. The survey asked for the drivers’ opinions on topics such as drowsy driving, speeding, driving while intoxicated, and driving while texting or talking on the phone. While most drivers agree that certain behaviors are unsafe, many make a regular practice of them. Drivers largely agree on speeding being unsafe. In fact, 88% of drivers disapprove of speeding in a residential neighborhood. That said, 46% admitted that they had driven over the speed limit in a residential neighborhood in the past 30 days. Meanwhile, 93% of drivers said that it was unacceptable to drive through a red light when they would have had time to stop at the yellow light. Regardless, 33% of survey participants admitted that they had driven through a light when they could have stopped. When asked about driving while under the influence, over 90% of all drivers agree that it was unacceptable behavior, but 2% had done so in the past month, and 12% had done so in the past year. Distracted driving is another topic of discord: 88% of drivers agreed that laws banning texting while driving were a good idea; 80% said that they believed texting while driving was a serious safety threat; 42% felt that laws should ban any phone use behind the wheel; and 70% expressed disapproval of handheld phone use behind the wheel, versus hands-free phone use. That said, 40% of survey respondents admitted that they had read an email or text message while behind the wheel, while 31% said that they had typed a text or email while driving. In Idaho, although talking on a handheld phone when driving is not illegal, the state does prohibit texting while driving. If you or someone you love has been injured by a dangerous or distracted driver in Idaho, find out whether you might have a claim for money damages by contacting the seasoned, knowledgeable, and effective Boise personal injury lawyers at Pedersen & Whitehead for a consultation, at 208-336-2552, with additional offices in Twin Falls at 208-734-2552.